It is, I suppose, the image of Sri Krishna as Lord of the Divine Love and Ananda — and the flute calls the physical being to awake out of the attachments of the physical world and turn to that love and Ananda. 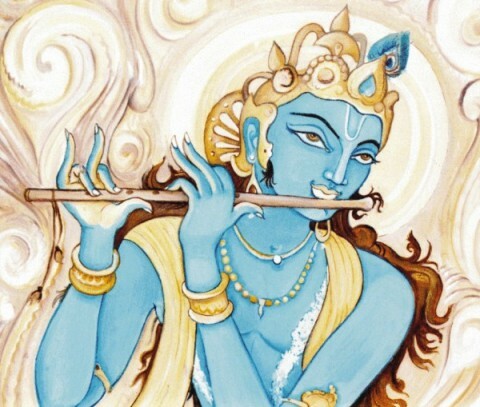 The boy with the flute is Sri Krishna, the Lord descended into the world-play from the divine Ananda: his flute is the music of the call which seeks to transform the lower ignorant play of mortal life and bring into it and establish in its place the Lila of his divine Ananda. It was the psychic being in you that heard the call and followed after it. This is the Krishna of the Gita, Krishna bringing the spiritual Knowledge, Will, bhakti — and not love and bhakti alone. The eye indicates the vision of the higher spiritual consciousness and the blue expanse indicates that consciousness. Krishna as a godhead is the Lord of Ananda, Love and Bhakti; as an incarnation, he manifests the union of wisdom and works and leads the earth-evolution through this towards union with the Divine by Ananda, Love and Bhakti.